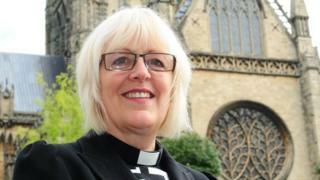 Image caption The Very Rev Christine Wilson has taken a leave of absence "for personal reasons"
The Dean of Lincoln Cathedral - the Very Rev Christine Wilson - has taken a leave of absence "for personal reasons", a spokesperson has said. The Chancellor, Rev Canon Dr Paul Overend, has also agreed "to step away for different reasons, connected to one issue". The cathedral said it was unable to comment further on the matter. It said the cathedral community was asked on Sunday to pray for the dean and her husband. Mrs Wilson became the Church of England's eighth female dean when she was installed at Lincoln Cathedral in 2016.